Large diaphragm FET omni-directional diffuse-field capacitor microphone. 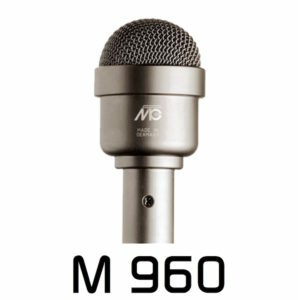 The M 960 studio condenser microphone combines well-proven large diaphragm capsule technology with the latest in semiconductor circuit topology. It is specifically designed to meet the needs of professional and semi-professional users who demand the highest performance. 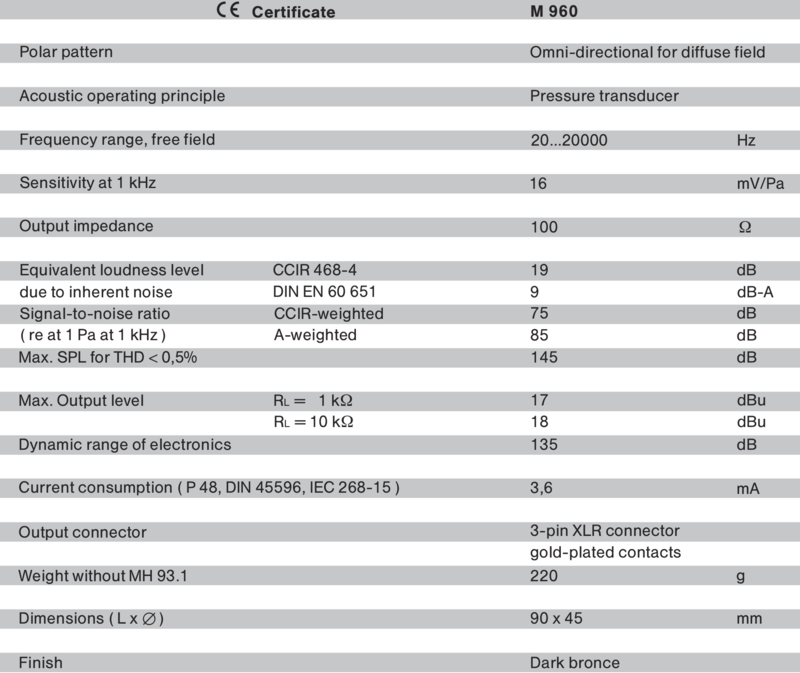 The M 960 is ideally suited for miking applications in broadcast and sound studios. Applications include recordings outside the diffuse-field distance during choir or orchestra performances, e.g. in concert halls, churches and theatres. The condenser capsule is designed for a diffuse-field. It exhibits a presence boost in the 4 to 12 kHz range. The electronic impedance converter uses a newly perfected circuit topology. This design reduces the noise floor to an extremely low level while also raising the maximum output capability. As a result, this microphone has a clean, distortion-free sound over an extremely wide dynamic range. The M 960 can be either mounted by means of the microphone stand holder MH 93.1, which is included or the optional swivel mount MH 93. If necessary the microphone holder can be exchanged for the elastic suspension EH 93 to further attenuate noise (in extreme situations). The M 960 connects to the microphone cable with a standard 3-pin XLR plug. Powering must be provided by an external 48 V phantom supply according to DIN EN 61938 and IEC 1938. 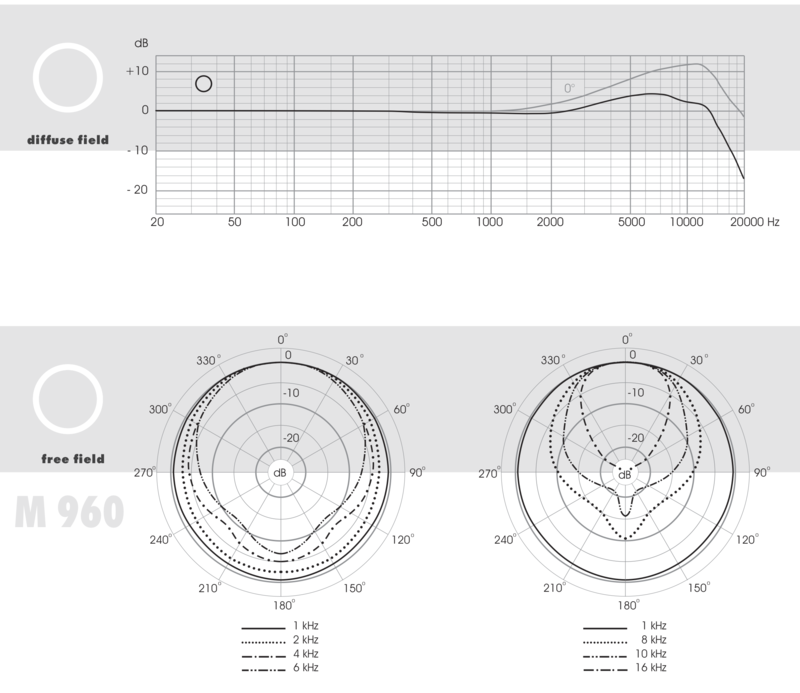 Although only measured down to 20Hz, in practice the lowest useable frequency would be about 10Hz.